The new Alex Trebek Alumni Hall is a symbol of the University of Ottawa alumni community’s commitment towards their alma mater, and a recognition by the University of its proudest ambassadors. The City of Ottawa presented the Alex Trebek Alumni Hall with an Award of Merit at the 2014-2016 Ottawa Architectural Conservation Awards. Nominated in the category of Adaptive Reuse (“adapting an old building for a new purpose while retaining its heritage character”), the award recognizes excellence in the preservation of the city’s architectural heritage. Read more. 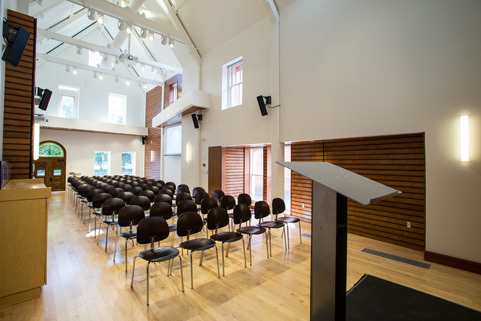 A spacious reception hall, meeting rooms and a welcoming lounge. Book rooms at preferred rates for receptions, weddings, conventions or business meetings. Attend seminars and networking events geared to their professional needs. Make lifelong learning a reality by attending lectures by fellow alumni or our leading professors and researchers. Access the services offered by your Alumni Association. Drop by any time during University office hours — this is your new home! To view more photos of Alumni Hall, please click here. Book a Room in Alumni Hall! Reservations can be made online through the uOttawa Conventions and Reservations site. If you have questions, would like a site visit, or need to change your reservation, please contact the Conventions and Reservations service at 613-562-5800, ext. 5771. Please note, the maximum capacity refers to a standing reception with little furniture, so the capacity may differ depending on the type of event and the set-up of the room requested. 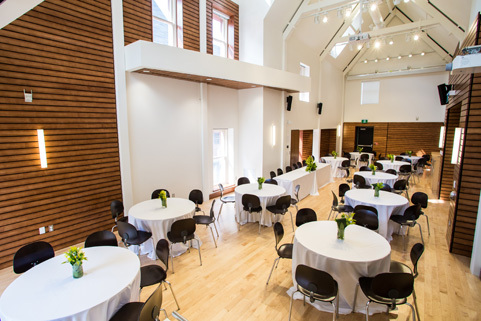 Renting the Alumni Hall includes exclusive access to Johnson Hall, the MBNA lounge and the Canada Life meeting room. For Johnson Hall and the MBNA lounge, note that there are set-up and tear-down fees, between $85 and $330, depending on the type and time of service. Cleaning fees may apply to any room reservation. To use the audio-visual equipment in the reception room, clients must use the service technician assigned by Conventions and Reservations.